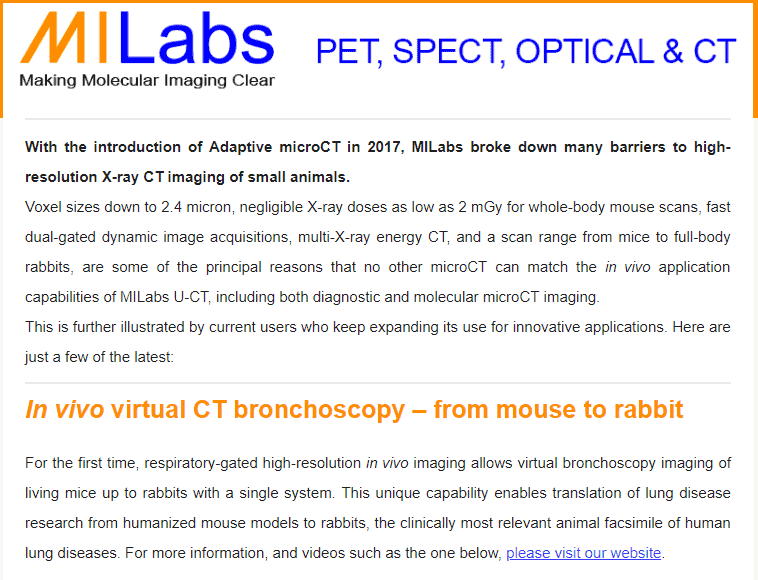 With the introduction of Adaptive microCT in 2017, MILabs broke down many barriers to high-resolution X-ray CT imaging of small animals. Voxel sizes down to 2.4 micron, negligible X-ray doses as low as 2 mGy for whole-body mouse scans, fast dual-gated dynamic image acquisitions, multi-X-ray energy CT, and a scan range from mice to full-body rabbits, are some of the principal reasons that no other microCT can match the in vivo application capabilities of MILabs U-CT, including both diagnostic and molecular microCT imaging. For the first time, respiratory-gated high-resolution in vivo imaging allows virtual bronchoscopy imaging of living mice up to rabbits with a single system. This unique capability enables translation of lung disease research from humanized mouse models to rabbits, the clinically most relevant animal facsimile of human lung diseases. For more information, and videos such as the one below, please visit our website. Now you can make X-ray “movies” of moving body structures or observe the movement of contrast dye through certain organs of interest. 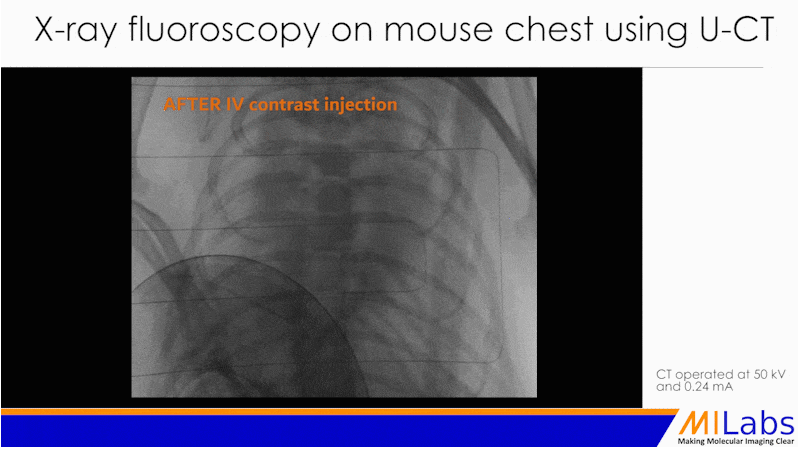 The exclusive fast readout capabilities of U-CT enable fast dynamic in vivo fluoroscopy acquisitions. Quantitative optical imaging of deep tissue has for many years been considered the holy grail of preclinical optical imaging. 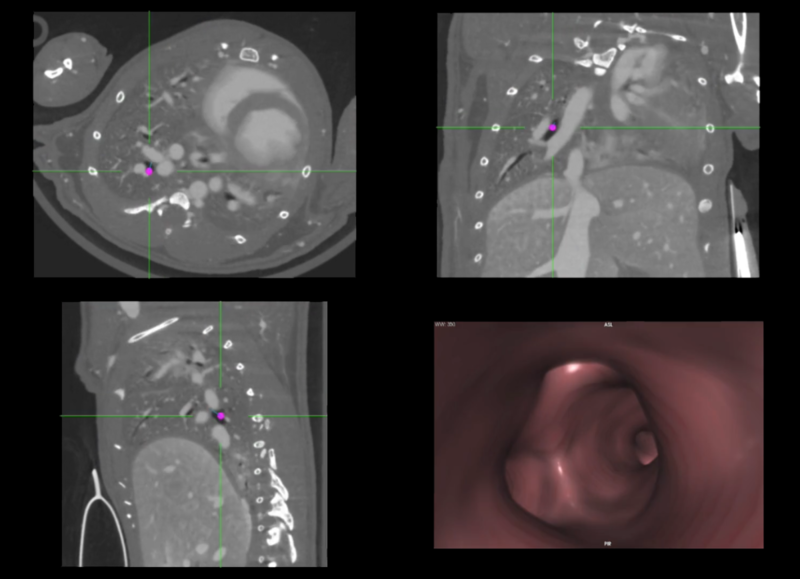 Using segmented contrast-enhanced X-ray CT images, users of MILabs VECTor OI-CT systems are now routinely able to reconstruct and quantitate diffuse optical tomography images. 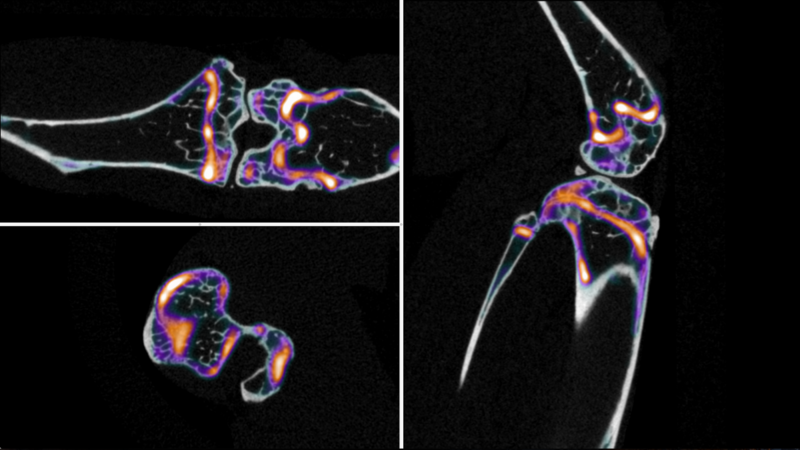 When MILabs’ microCT is used with the SPECT option, researchers can finally eliminate the tedious, time-consuming, and error-prone steps from traditional quantitative 3D autoradiography. As such, researchers can bridge the gap between in vivo and histopathology with a single system. Please let us know if you’re interested in a private meeting at sales@milabs.com. We hope to welcome you there! Copyright © 2019, MILabs, All rights reserved.